Rating agency Moody’s expects the recent California wildfires to be among the costliest on record for U.S. P&C insurers, with losses running into a credit negative close to $4.6 billion based on historical events and the number of structures damaged. “Assuming CAL FIRE’s estimate of 5,700 structures destroyed and an average value of $802,000 per structure losses would be close to $4.6 billion and growing as the fires continue. “Catastrophe modelling firm RMS issued a preliminary insured loss estimate of $3-$6 billion and said there was significant uncertainty around business interruption, particularly for the wine industry. “According to CoreLogic there are over 172,000 homes exposed to wildfire risk in the Napa and Santa Rosa metro areas, with a combined reconstruction cost of more than $65 billion,” Moody’s noted. Insurers with high exposures in the affected counties of Northern California will be hit with the highest losses with homeowners and commercial property coverages bearing the majority of damages. Auto physical damage and inland marine could be among other lines of business to feel limited impact. Moody’s said some reinsurers operating in the region will likely experience losses from quota share, per risk or aggregate cover contracts. The scale of the event may cause some insurers to reduce wildfire exposures in the region, raise rates for affected policies, or buy additional reinsurance. The catastrophe will likely spur California homeowners and commercial property insurers to take further actions to reduce wildfire risk. The wildfires had caused 40 deaths, destroyed 5,700 homes and commercial structures and burnt more than 221,000 acres as of Saturday, according to the California Department of Forestry and Fire Protection (CAL FIRE). 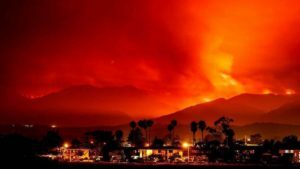 The California wildfires could make 2017 a record year for the peril, with losses among the highest in the last ten years and 8.5 million acres burned nationwide through October 6th, according to the Insurance Information Institute. This supports the findings of several academic studies that state wildfire exposures for the Western U.S. have recently increased because of drier forests, a longer burning season, and higher average temperatures.